Goodmorning! 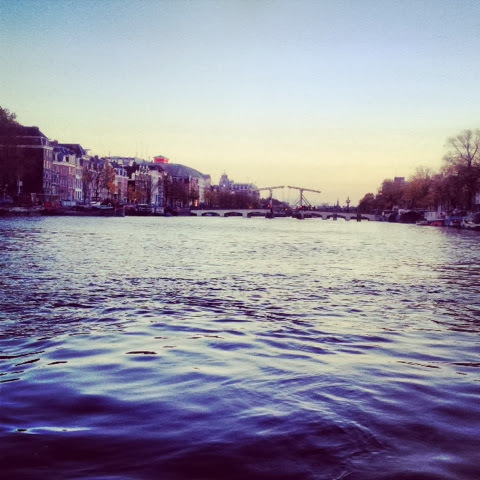 At last I can tell you all about our weekend in Amsterdam, it's been such a busy couple of weeks! 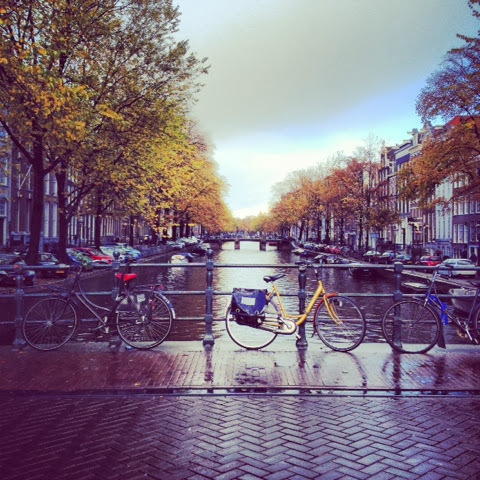 My recommendations about Amsterdam usually start like this: "I count myself lucky that my first visit ever was with my dad; he took me along to one of the conferences he was attending, so I got to appreciate Amsterdam's culture and not the sub-culture" (wink, wink & elbow nudge). the art lovers indulge in the newly refurbished Rijksmuseum and the Van Gogh collection, the bohemians chill out in all kinds of cafés, the foodies are spoiled for choice, the shopaholics can raid vintage boutiques in Waterlooplein and Nine Streets all the way to designer shops in Hoofstraat and the jewellery lovers can adorn their ears and fingers with magnificent diamond pieces. the unique angles to view the city from! If you haven't booked anywhere head to the lower part of Spuistraat for dinner. Humphrey's hides behind a black exterior but opens up to a split level space, decorated with chandeliers, wooden floor and intricate railings that make you feel you are in an upmarket restaurant in colonial Vietnam. 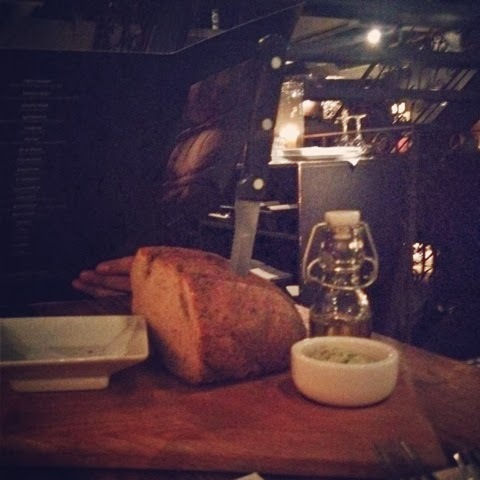 The food is modern Dutch, but the best bit is the bread. It arrives stabbed with a knife, escorted by glorious butter and a tiny olive oil bottle. It's delicate and crispy on the outside but soooo soft on the inside. One thing about Dutch cuisine that you have to prepare your tummy for, is butter. My starter, prawns with garlic, was lovely but the prawns seemed to be swimming in butter and guess what? it was my excuse to eat more bread; dipping galore! The "subtle" entrance at Humphreys! probably one of the best loafs of bread I've ever had! For more traditional Dutch food, we went to Greetje, a corner restaurant lodged in a quite residential district. You know you are in good hands when you walk in and see whole groups of locals enjoying their Saturday night meal, but remember to book in advance. Its' deceptive appearance doesn't give away much, yet we were treated to our own little area, with a rustic oval grey table and a massive flower arrangement! My friends were well-impressed. Score! We had beetroot biscuits to start with and duck as a main. 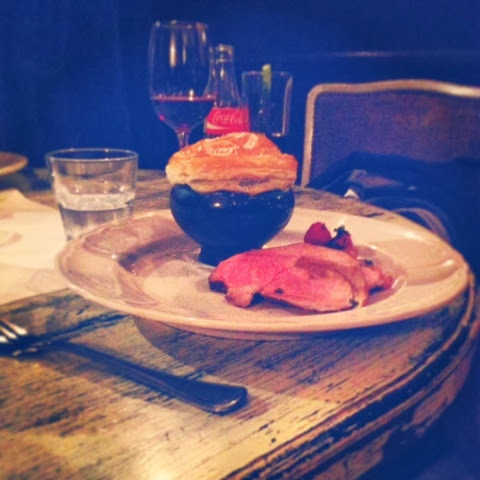 The biscuits were soft and not as strongly flavoured as I had thought; the duck was succulent and well prepared, perfect chunks next to a puffy mushroom pie! Being one of the traditional dishes of this part of the world, you must give it a try! Before dinner we popped into an art deco bar for a cocktail, right across the street from Greetje (in Peperstraat) but unfortunately I didn't look at the name. 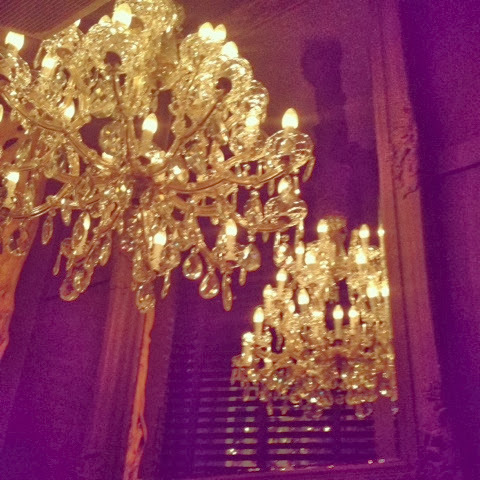 It was dark and mysterious, the cocktails were flambeed right in front of your eyes and as we sat next to the big windows with a tiny candle lighting our corner, we both felt like going back in time; a "Midnight in Paris" kind of moment. On the way to Spuistraat our friends pointed out a couple of more local, smaller cafés, that looked like safer options to stop at and have a hot chocolate even, while watching the tourists inhale in smoke for dear life! Funny, you must admit! 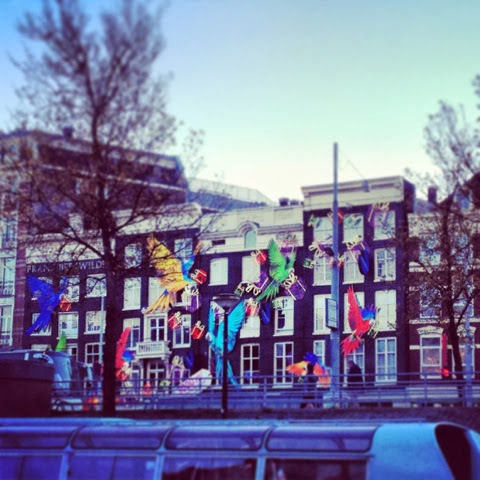 The Tweede Kammer plays Latin chilled out music in a wood-panelled setting and the Dutch Flowers has a great view of Herengracht. If you are thinking "dodgy" cafes, think more "the next Steve Jobs-types" sitting next to the windows, having a coffee, working on their laptops; times have changed! Compared to these little ones, the very touristy cafés like the Grasshopper and Bulldog, looked like Irish pubs on steroids and certainly not inviting, for me anyway. 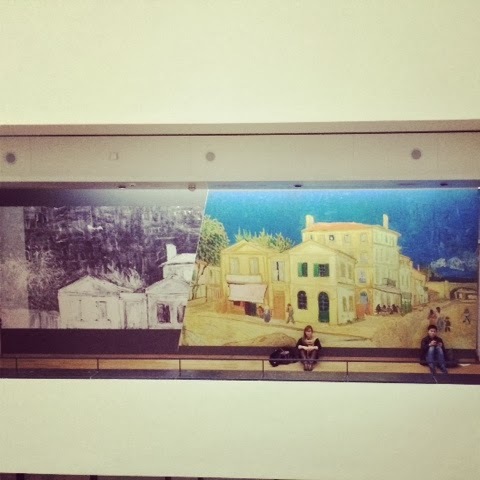 Did you know that Van Gogh did all of his famous work within a ten year period? if you feel you have a talent, you must unleash the beast! 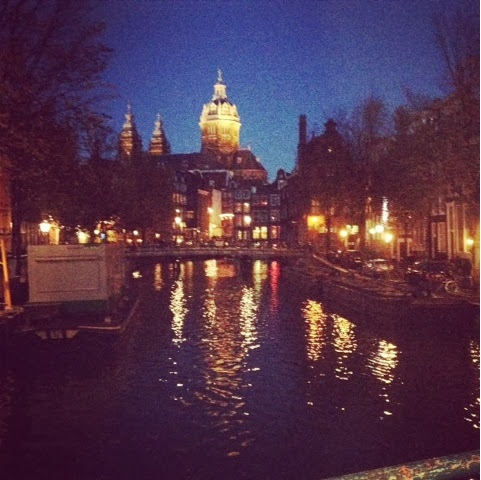 This reminds me of a Christmas card and yet... it's right in the middle of the Red Light District! 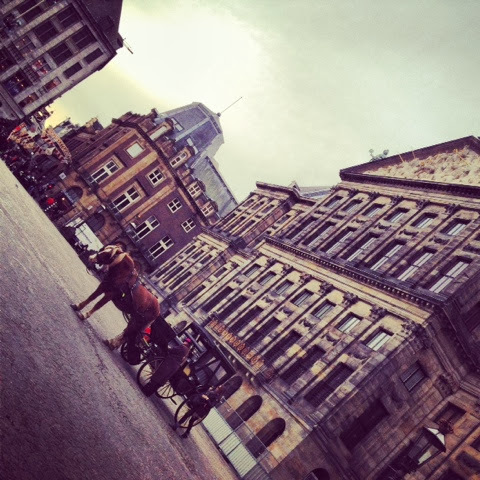 Leidesplein is buzzing all the way to 3am on a Saturday - or should I say Sunday - morning! We opted for Little Buddha, funky mix of nineties RnB and hip-hop, not impressed with the music but the place was busy because of the MTV EMEA awards and Jay Sean was on the decks - if that means anything to you; 20 euros and we walked straight in, bizarre? Sunday was my absolute favourite, it was all about lounging and strolling. Brunch in George café was just what we needed to start the day in a relaxed and chic environment. 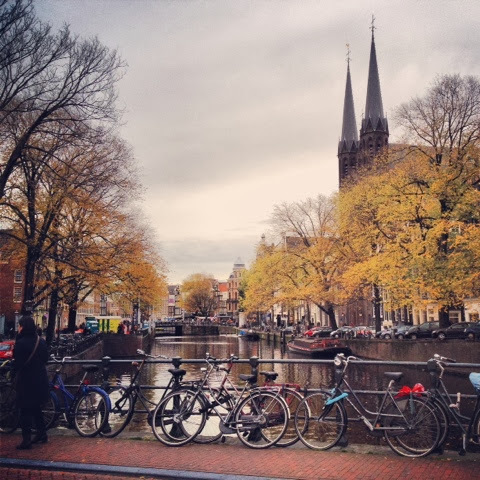 We opted for walking from our hotel in Damrak and were rewarded with some of the most scenic views around the Nine Streets and Leidesgracht area. 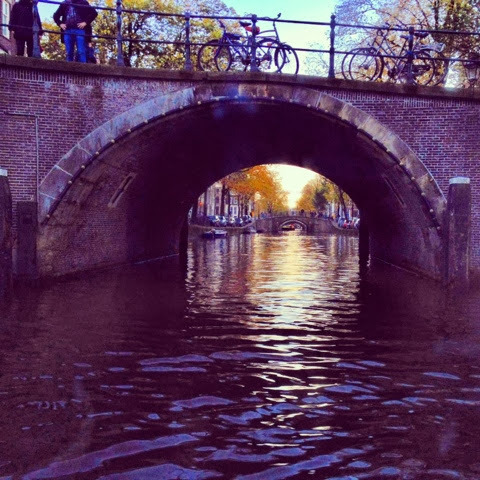 It was sunny and crisp and I would have gladly moved straight into one of the apartments overlooking the canals in Nine Streets district! It's buzzing but not manic and people seem to take a moment to sit and grab a coffee every now and again. Brisk Sunday morning walk with the girls! 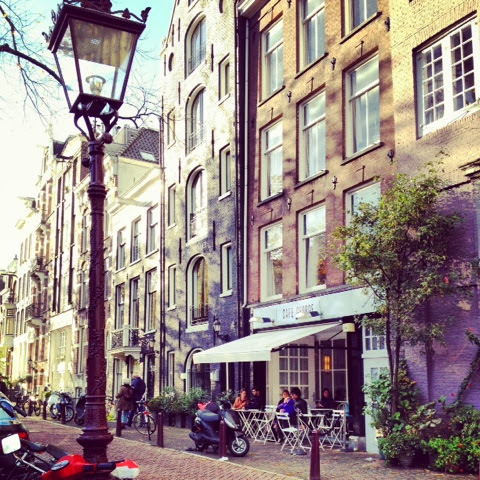 Caffe George on Leidesgracht - picture perfect?